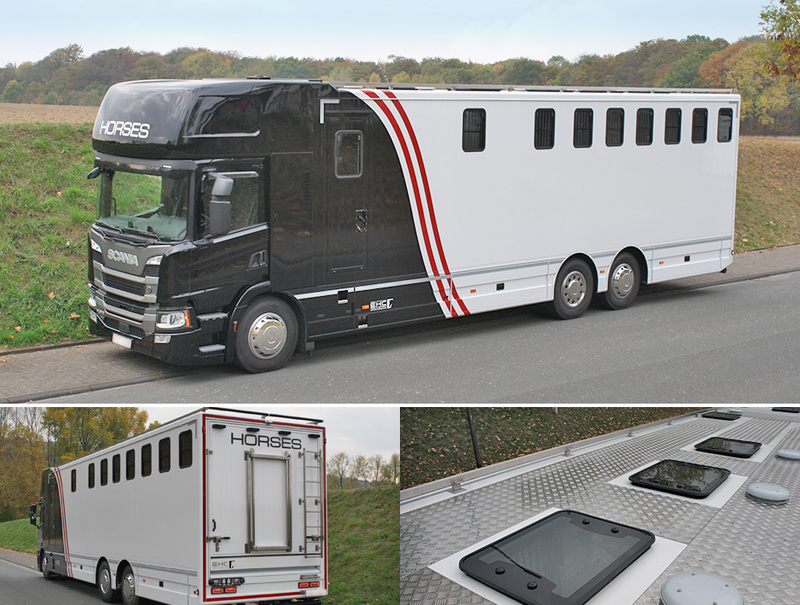 The recently produced and supplied EHC horsebox which is shown here offers loading facilities for sulkies on the roof and rear of the vehicle. For this purpose EHC uses specially manufactured steel fittings that ensure simple and safe attachment of the sulky. We'll also be happy to advise you on the production of transport fittings for your vehicle, as well as numerous other innovative vehicle construction ideas, both for the interior and the exterior. 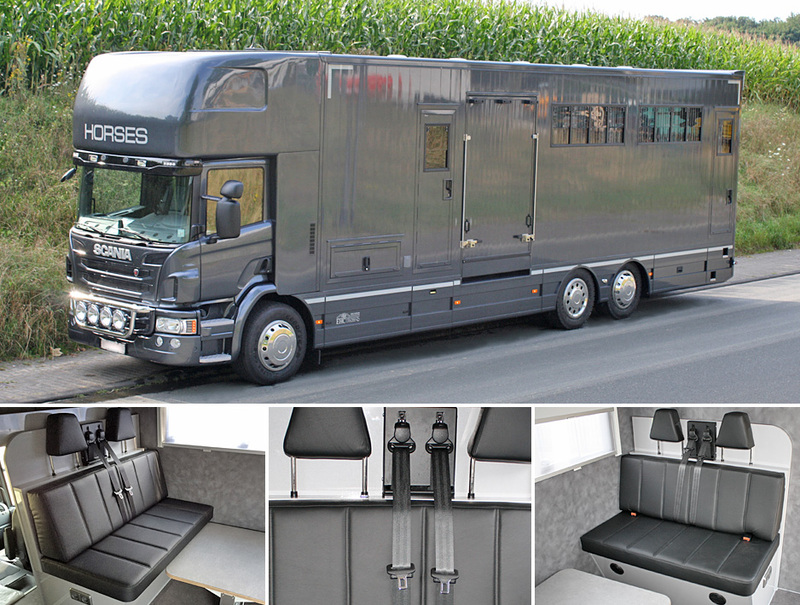 As part of its well-known high-quality vehicle production, in addition to the driver's cab EHC also offers you optional TÜV tested fitted seats in the back “seat and sleeping area” of the horsebox. The seats are manufactured according to the requirements of the road traffic regulations for passenger transport (§ 21 StVO – Germany), and are fitted with seatbelts for the corresponding number of persons – illustration shows seating for 4 persons. 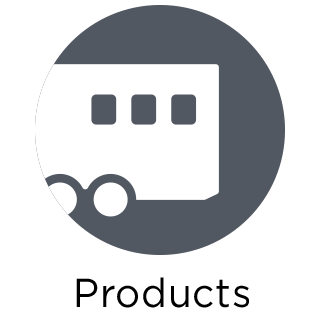 We'll be happy to advise you on a wide range of equipment options for your vehicle. We look forward to welcoming you to our new EHC website! The ease with which we can find our way around the Internet today with access to innumerable online offers using a smartphone while on the move has induced us to present our company optimally with a refreshed website on media such as smartphones, tablets, laptops and PCs. As we continue to develop as a family business, we also want to present this progress to the outside world. 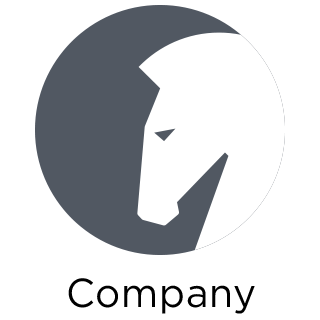 We hope that our website and the products on display will inspire you to entrust the development of your next horsebox to us. Here we report regularly about news relating to EHC GERMAN COACHBUILDERS. 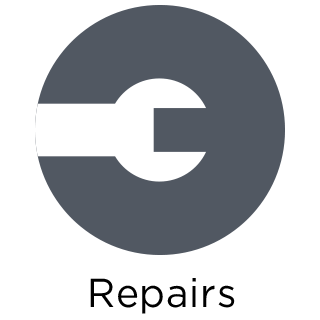 We look forward to your feedback, enquiries about our products or questions and comments. We also look forward to hearing how we can best support you in equestrian sports with our vehicles and equipment. Our main goal is the proverbial happiness of horse and rider. The reigning European Champion in show jumping is Peder Fredricson with his horse All In. In August 2017, the Swedish rider won in front of more than 15,000 spectators in the Ullevi Stadium in Gothenburg, ahead of Dutch rider Harrie Smolders and the Irishman Cian O'Connor. 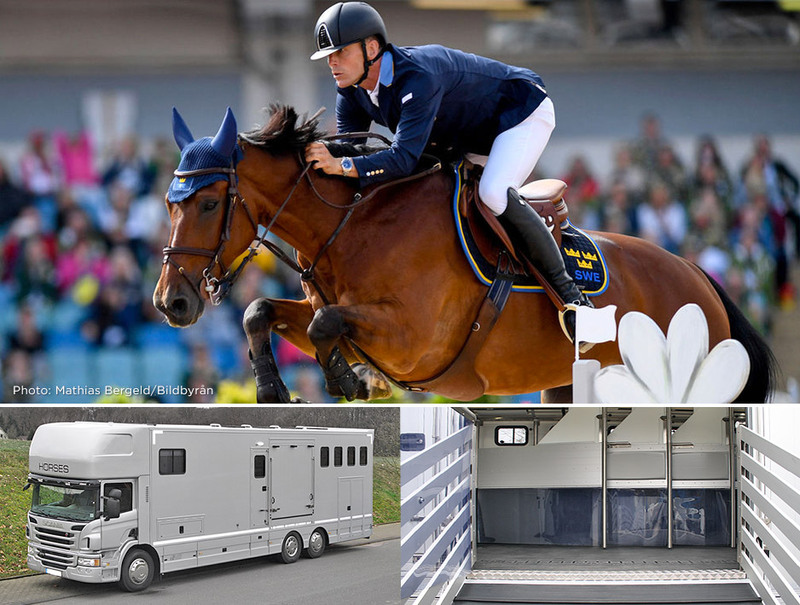 For the European Champion and winner of the Audience Award, EHC built a specially designed horsebox with living and sleeping areas and a horse compartment for professional use. We are proud to be building the 5th EHC vehicle in a row for Lisen and Peder Fredricson, and we would like to thank them very much for their long-term confidence in us and extraordinary cooperation. The Swedish music group DONNEZ will be touring in a tour bus specially designed to meet their needs by EHC. The vehicle is equipped with living and sleeping compart­ments for the musicians in the front section, as well as a special cargo area for the musical equip­ment in the rear of the bus. Mercedes-Benz in Sweden presents the vehicle on its own website – see link. The tour bus is also presented in detail in a Video on YouTube, with a recor­ding from a TV pro­gramme. In addi­tion to the vehicle superstructures for horse trans­porters, EHC also produces vehicles for the profes­sional transport of tour equipment.